In this article, you will learn about two main concepts in the blockchain world. Proof of work and proof of stake. What is proof of work in Bitcoin World? In the Bitcoin world, the transaction that happens is not dependent on any third-party operator. For example, when you make a transaction using your original currency through visa or master card, they act as a third-party who transfers your amount to another account. But in case of Bitcoin world, the transactions are managed by various blocks which form the blockchain technology. So to make the block function properly and record every transaction, bitcoin miners need to solve some complicated set of puzzles or algorithms and create a block. To solve this mathematical puzzle, it requires a massive amount of computing power. When any miner solves the puzzle, he/she creates a block and then, the miner will send the new block to the network for other miners to verify it. The question must be arising in your mind as for how they are awarded for creating those blocks? The answer is these algorithms are solved to make your transactions in this virtual world secure. Since Bitcoin is a decentralized currency, it is not controlled or governed by any central body. So, how to track any transaction happening with this currency? This is precisely what miners do. They solve the puzzles, create various blocks and maintain the BlockChain which guards every transaction and keeps the system secure. This procedure is called as proof of work or POW. You do some work for which you are paid. What is proof of stake in Ethereum and related protocol? As Ethereum is widely known as another decentralized cryptocurrency, this virtual currency network used to operate using the POW but now it doesn’t use the Proof of Work system to validate any transaction happening on their network. This system first determines how much currency a person holds. Based on that a person is assigned to mine only the percent of the cryptocurrency he/she holds. For example, if you own 1% of the cryptocurrency that is available then you are entitled to mine 1% of the blocks. This method is more secure as compared to POW system as it is more secure from the 51% attack by fraudulent miners. The POW system uses normal electricity for its transaction. This means when a miner uses its power to solve block puzzles and solves it, he/she validates a transaction. This, in turn, gives him the award regarding Bitcoins. But in PoS system it doesn’t depend on the electric power to generate cryptocurrency for you. Only if you hold a certain amount of cryptocurrency you are allowed to mine and that too limited. So basically, it is least dependant on the electric power supply. So comparing both the systems lets discuss their advantages and disadvantages. The POW give rise to a series of miners who work for the stability of blockchain and make the network and transaction very secure. The system of POW makes it easier for miners to make their 51% attack. This means that a miner or a group takes over 51% or more than that of the hash rate (computational power). This gives them the power to manipulate and create fake blocks redirecting some transactions towards their account. They can stop transactions, reverse transactions or even create disturbances in the whole system, but they certainly can’t create a new Bitcoin. Total 21 million Bitcoins can be mined and owning 51% of the computational power doesn’t make you the creator. Although this kind of attack is considered as hypothetical but should not be ignored. If you take present scenario into account, the mining of Bitcoins are more time consuming, getting more difficult and consuming a lot of electricity and the amount they are getting for the mining are too less. This makes it less profitable. Hence, lots of miners are opting out of mining and solving the codes which is slowly making the system less secure and more susceptible to attackers. 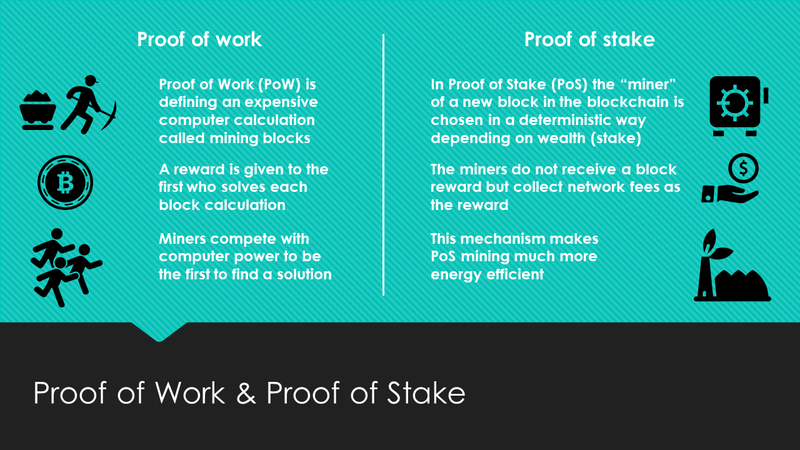 The basic advantage of proof of stake is that it is more secure as compared to POW system. Both the POW and PoS uses trustless and distributed consensus. This means, if you wish to go ahead with a transaction, then you won’t need the help of third-party system to monitor and leverage your transaction. Distributed means the whole community who believe in the existence of the cryptocurrency and oversee the transaction and what’s more? They validate each transaction and every person holds a copy of each transaction that is going on. The miners are determined concerning the amount of currency they hold. The PoS doesn’t have any solid disadvantage except that you need to hold some asset before becoming a miner or a forger. This removes many people who wish to start mining from scratch. It doesn’t reward you for block creation. You only receive the transaction fees but no separate reward for making the system secure. So basically, none of the systems is 100% free from virtual attacks. But since most of the cryptocurrencies use blockchain technology, it is important for the community who believe in them to work together to make the system and the transactions secure on this platform. No matter how these protocols function, the final objective of every cryptocurrency is same, i.e., to create a secure dimension in which a singular decentralized currency will drive all the transactions. Established in 2017, a community of blockchain and cryptocurrency enthusiast. Our goal is to continue to build a growing blockchain community offering the best in-depth blockchain articles, cryptocurrency reviews, ICO listings, Crypto investment tips and much more on the blockchain world.